The official show magazine is rightly regarded as essential reading for property professionals and investors alike. 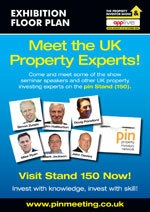 In each of the 6 weeks preceding the show we will email a newsletter to 45,000+ investors and property professionals. This audience comprises previous show visitors and others who have opted-in to receive property investment related material from us. To view an example from a recent show, click here. Because your advertisement is delivered in html format, your ad can include active links to your website or any other `call to action` mechanism you choose. There are only 6 of these opportunities available before the show. The show website is the main `call to action` in all of the show` s marketing material and will process thousands of visitor sessions in the 4 weeks before the show opens. These site visitors will be people registering for the show, other property investors and `trade` visitors. A limited number of `top of page banner `(468 x 60 pixel) and `side of page skyscraper` (120 x 600 pixel) positions are available - and of course these website ads include active links to your website. Every visitor to the show is handed the official show bag (containing the official show magazine). One side of this displays the show name and sponsor logos. But the other side is available for a sponsor to use as required. Every visitor to the show will spend time talking to the thousands of exhibitor staff on duty. Badge/lanyard sponsorship keeps your branding in the eye-line of all of these visitors (and exhibitors). Without doubt the most referred to document you will see within the exhibition hall. ... talk to us about sponsoring a Seminar Theatre, sponsoring the exhibitor drinks party, or constructing a bespoke package tailored to meet your specific needs.